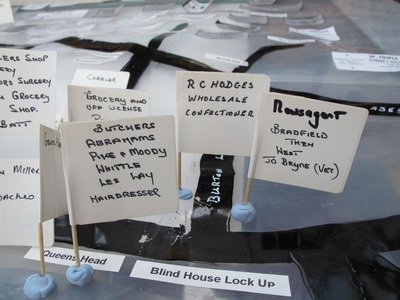 This is a reconstruction of the marvellous exhibition that Eric and Sandra put on at the Methodist Church in 2013. 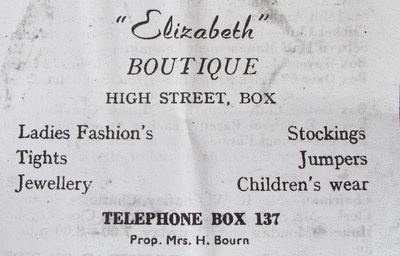 It accompanies the article charting the location of Shops in 1950s Box. This was enjoyed by many people who have asked for it to be remembered. 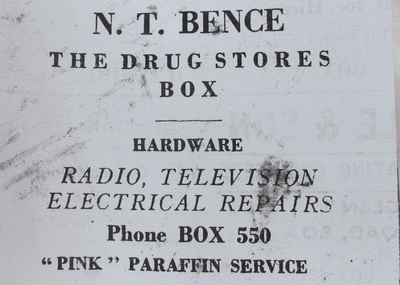 Fifty years ago Box was a remarkably self-sufficient village. It had to be when lack of transport and more meagre resources meant that people were reliant on facilities around them to supply their needs. Box did this wonderfully well. 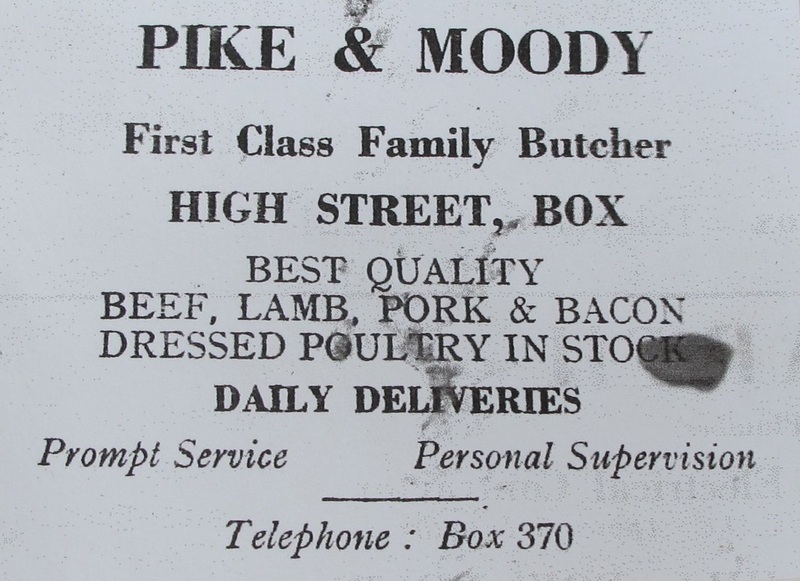 It was a small commercial hub serving quite a wide area, but within walkable distance for everyone in the parish. Products needed to sustain everyday life were readily available. 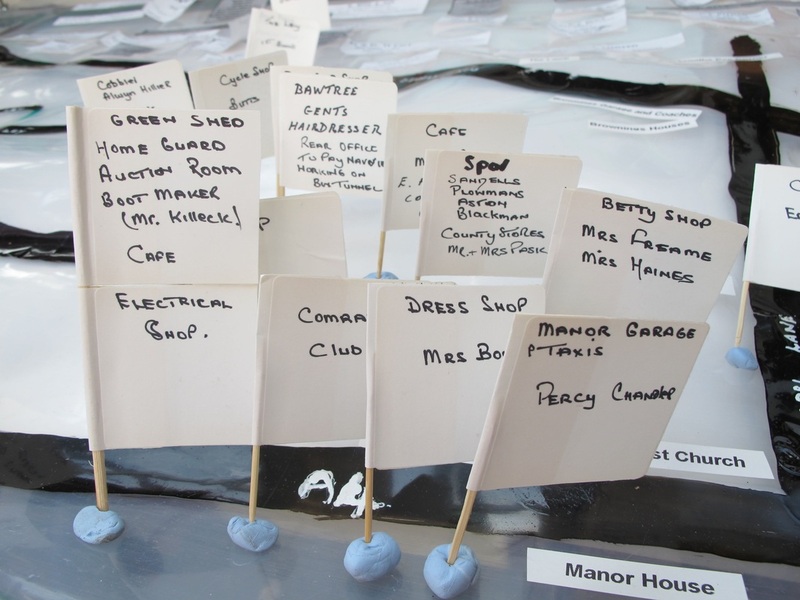 It was possible to find virtually everything needed for day-to-day survival, many centred within a matter of a couple of hundred yards in the heart of the village .You could get your shoes repaired (or made), buy a dress or material, buy wool to knit, have your bicycle or radio repaired, purchase furniture and electrical goods, buy materials to mend and decorate your home and the services of a blacksmith to mend or make your ironware. 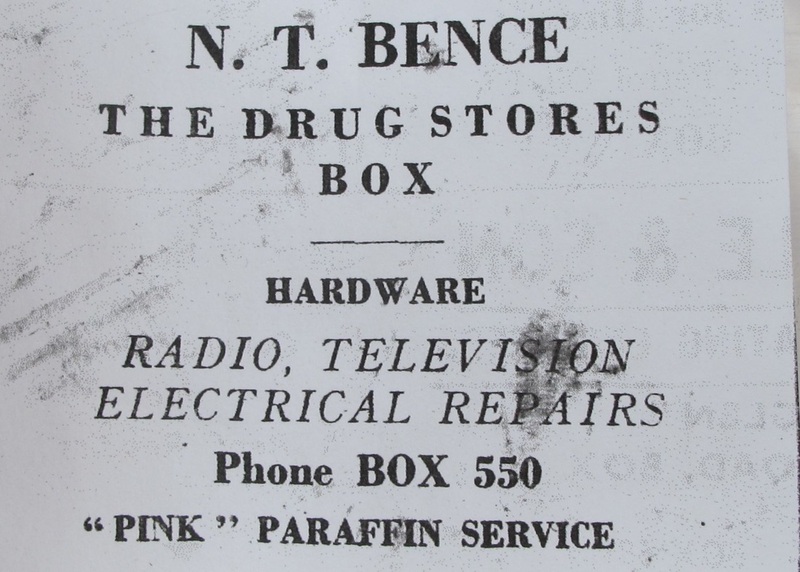 The centre of Box offered a variety of shops and services to reflect an economy of patch and mend which no longer exists in quite the same way. 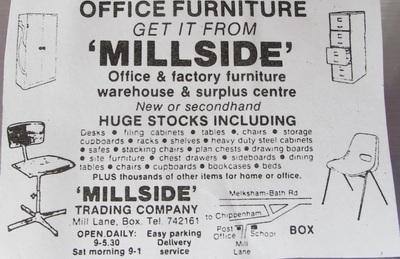 It reflected a society where trips to Bath, Chippenham and even Corsham would have been only occasional excursions. Eric and Sandra Callaway's fascinating reconstruction of the Box's commercial centre shows just how concentrated this activity was and how easy it would have been to obtain just what you needed from the people who lived around you. The centre of the village looked entirely differently to our modern shopping centres. There were no banks, no fast food outlets and no estate agents. To buy daily food needs you would visit several shops (butcher, baker, greengrocer, grocer) rather than a single supermarket. We shouldn't think that all shops had a long existence in the same way that modern corporate shops continue regardless of the manager. 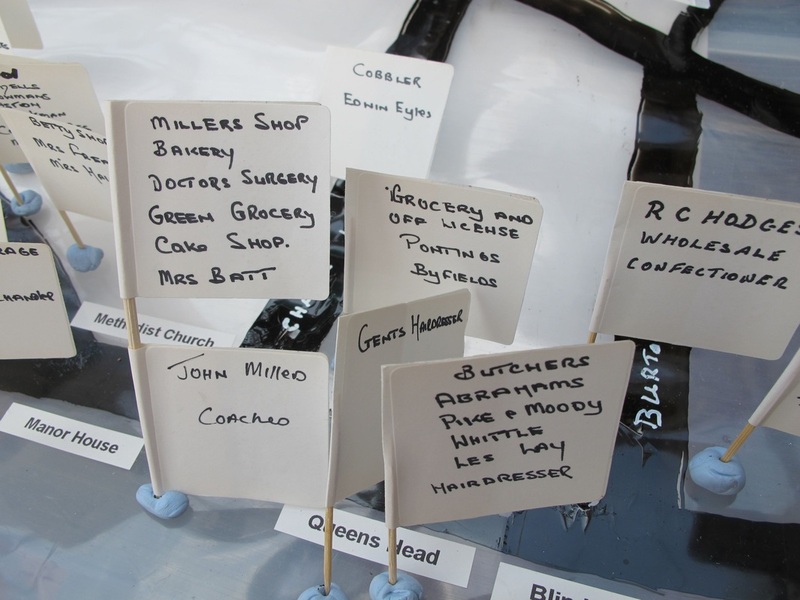 Many were personal to the shopkeeper or occupier, such as wheelwright, coal agent and dress maker. 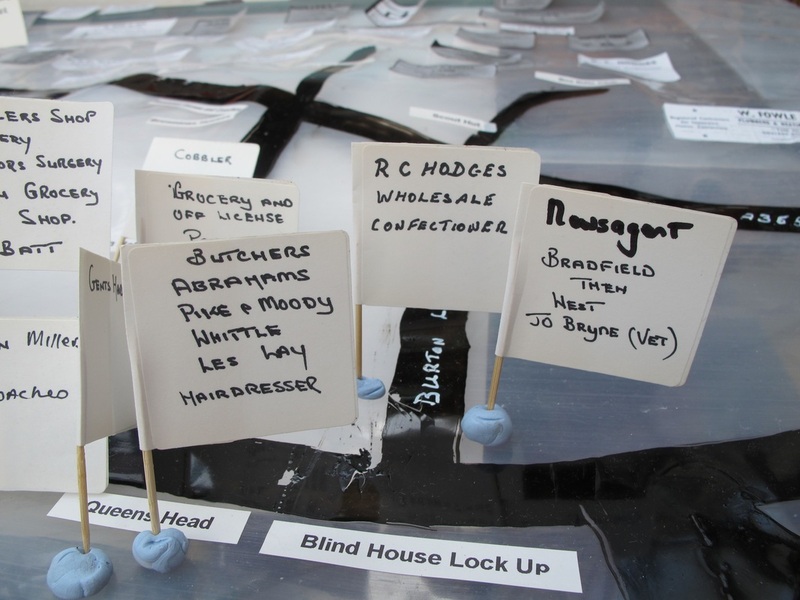 These shops often closed on the retirement or death of a particular owner. 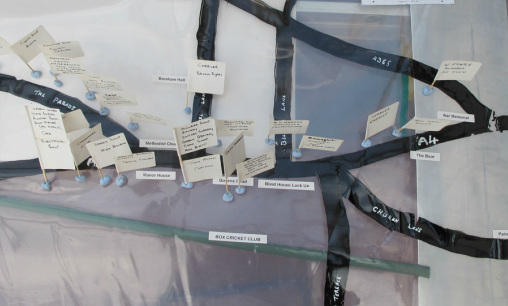 Other shops in the centre achieved sufficient profitability to be sold to other owners or were in an ideal location for passing footfall to be acquired and different services provided by the new owner. 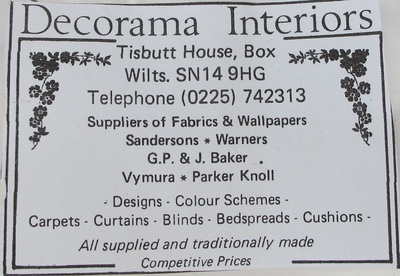 The range of services that these shops provided is well demonstrated in the collection of advertisements that Eric and Sandra have assembled. 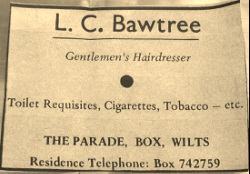 In 1956 Les Bawtree used to cut hair in the front room of The Queen's Head before he moved to the Parade. His was a Gentlemen's Hairdressers and he sold some gentlemen's products. He had a red and white striped barber's pole outside the Parade shop for many years. Before those times, the back room of the shop was used as an office to pay navvies working on Box Tunnel. 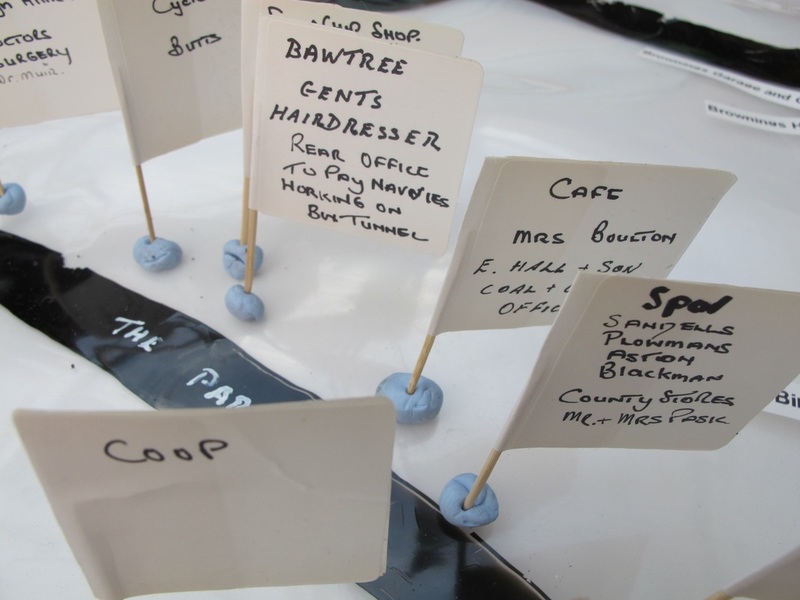 A bakery was there first, then it became the doctors' surgery with Dr Davey. Afterwards Mrs Miller took it over as a greengrocery. Webbs cake shop might have been there. 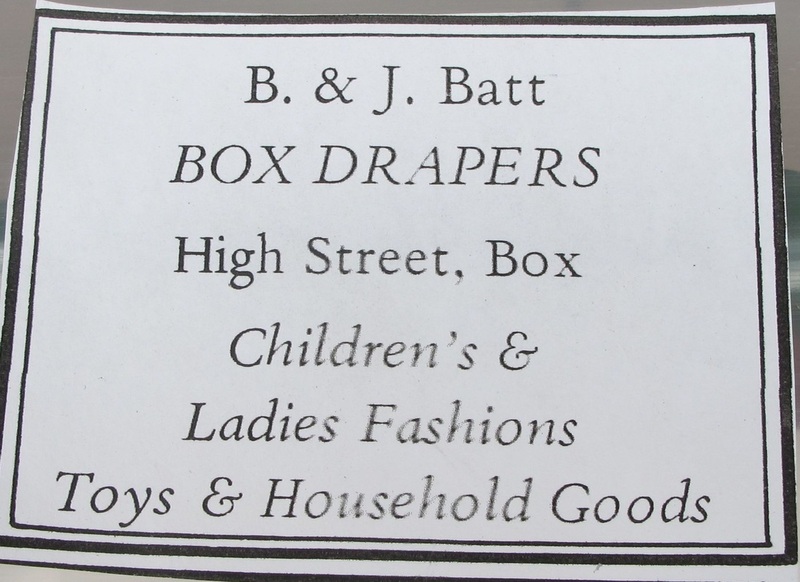 Later Mrs Batt sold clothing. Always there next door came Mr Miller's coaches. An early memory about Dr Davey's surgery was that the first door you went into was into the waiting room. To the left (now the kitchen window) was the surgery. Amy Miller (John's mother) had a room at the top of the building. After her death, the family lost the key to the room and when they eventually found it the room had been left as it had been years before. Abrahams the butchers started in the 1920s when Ernest Abrahams, Eric's great grandfather, opened the shop. 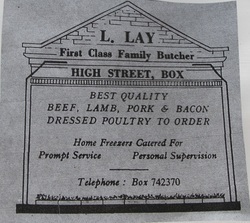 The family also had a slaughterhouse at Box Hill and other shops at Winsley, Corsham and Colerne. George Abrahams, the son, later took it over. Later the business was run by Pike & Moody, then Whittles and lastly by Les Lay and his son Rob, who married a local girl Lesley Goodhind. 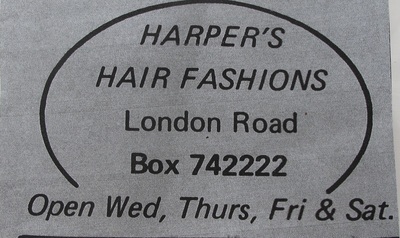 Now, of course, it is a hairdressers. Ben Drew took his horse-drawn van up to the Rising Sun, where young boys used to sit on the wall. If you didn't ask him to give you something, he would voluntarily give you a little loaf, but nothing if you did ask. 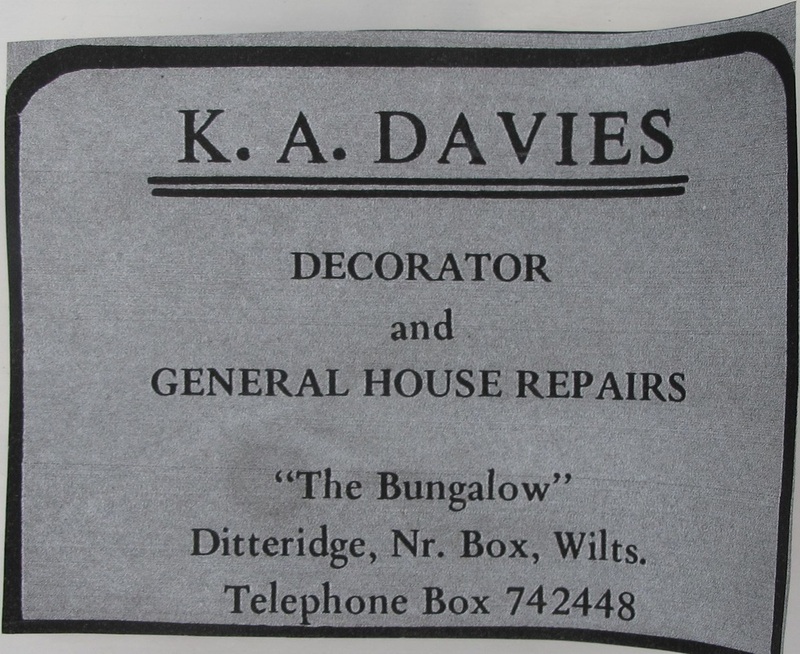 There was a bit of competition between Ben Drew and the Bradfields. 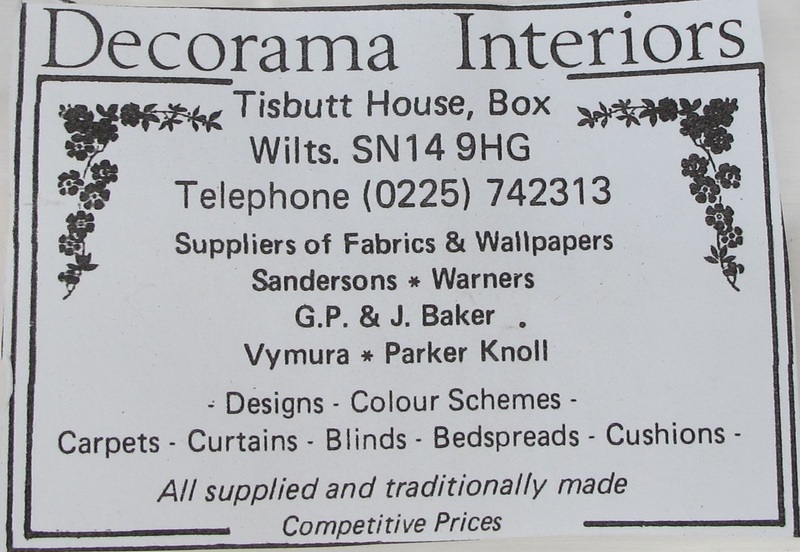 The shop opposite the school has been many different businesses. 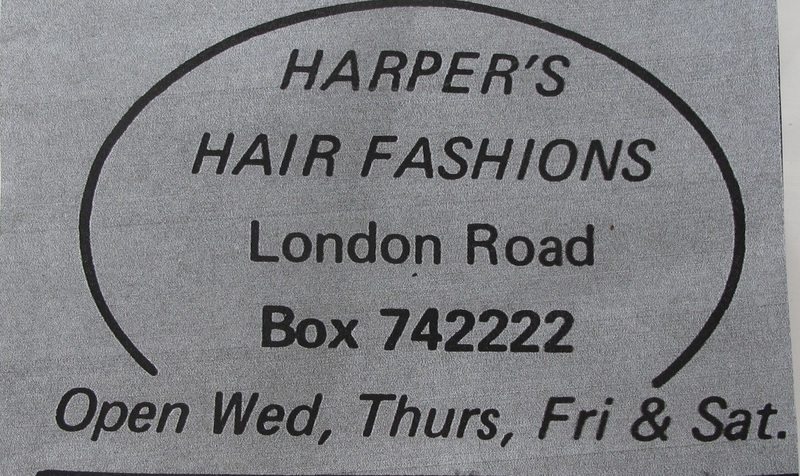 Mrs Barker ran a hairdressers from the shop; then it was Ann Webster took over the business. Later it became a second-hand clothes shop, then a greengrocer's shop run by Gill Cook. 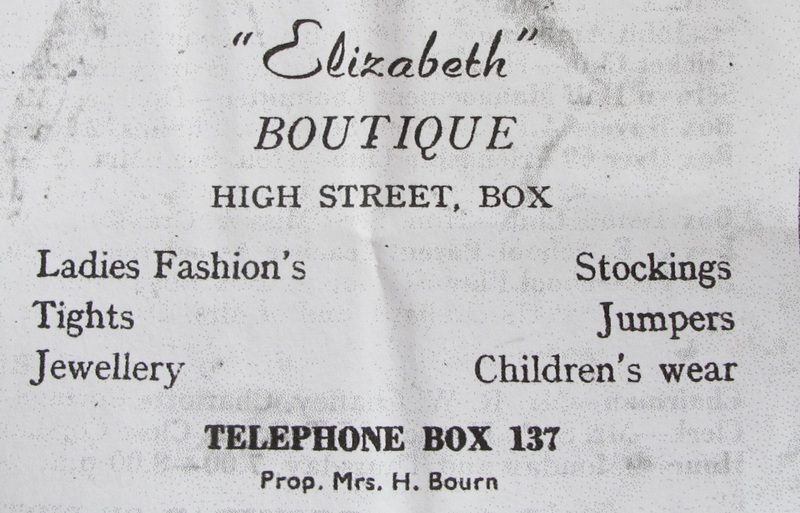 Most of the hamlets had a shop, which often included a post office: the main one in The Market Place had recently moved to London Road and was run by Miss Esther M Fudge. 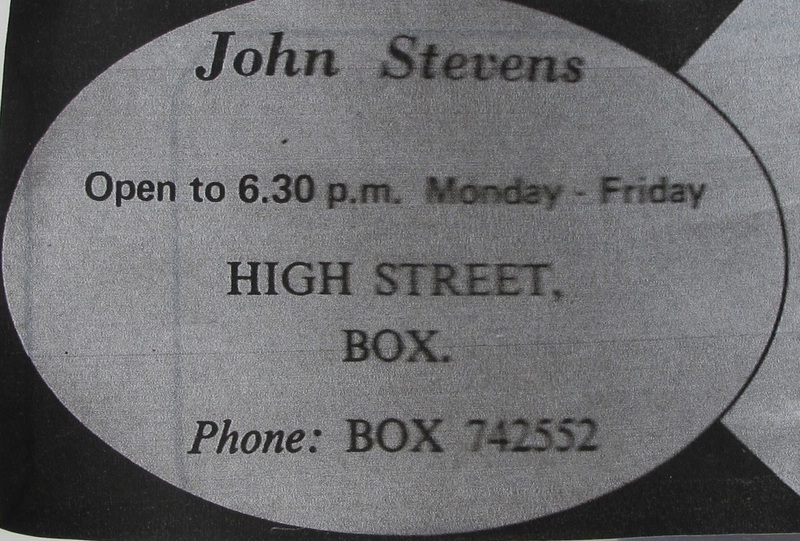 Sub post offices existed at Ashley (controlled by Mrs Mary Ann Ford),at Kingsdown (John Brooke) and at Box Hill (William Maslen). 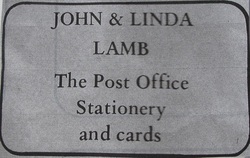 The post offices in the hamlets were sub-offices and closed for lack of trade. 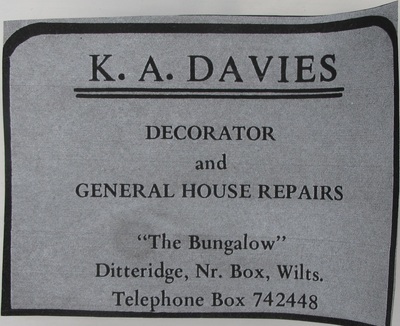 The main office in the centre has been accompanied by various businesses: a cafe in the late 1960s, later a hairdresser called Flair. 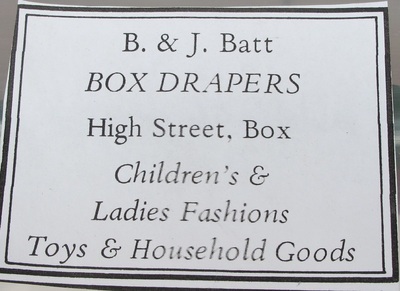 Can you tell us more about Box's shops? We would love to add to Eric and Sandra's pioneering work.